Since the new year is officially upon Us, we’ve been thinking that it’s time to give our essentials collection an upgrade and, of course, our number one staple is always leggings. A style that can easily mix and match with everything in our wardrobe, it’s always smart to have as many leggings options as possible. We wear them to work when we can show off our trendiness, while running errands when we want to look a little extra chic and any time we go out and want to look like we put in a whole lot of effort into our outfit. At Shop With Us, we’re always on the hunt for a design that highlights our figure while keeping Us as comfy as possible. This faux leather offering is snug but also extremely flattering and we are so excited to add this garment to our collection! 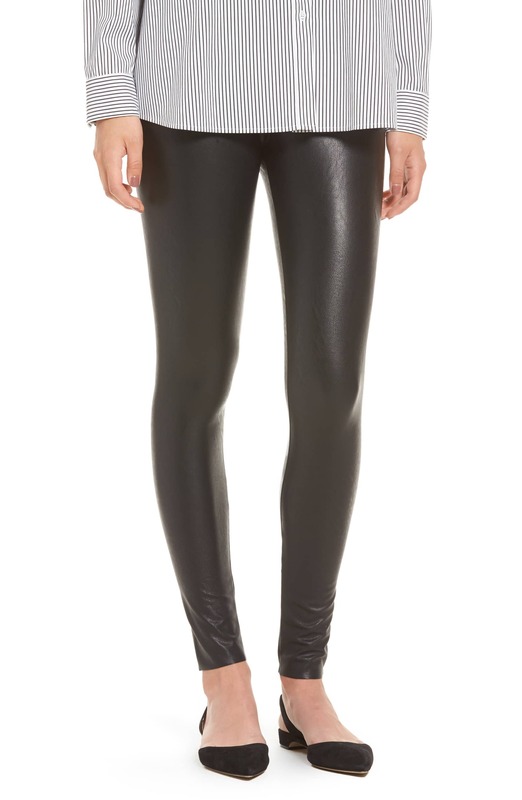 See It: Grab the Commando Perfect Control Faux Leather Leggings at Nordstrom for only $98 in multiple colors. Nothing gets Us going like a sleek design and the Commando Perfect Control Faux Leather Leggings are just the ticket! Made with a buttery soft fabric, this number will feel super soft against our skin for the maximum level of comfort. We love pants that allow Us to highlight our figure and these trousers are no exception. Made with a high-rise construction, these bottoms sit above the waist to create the illusion of an hourglass silhouette. There is also a shapewear effect that controls and shapes the hips, thighs and rear for a sculpted look. A great way to serve up a touch of attitude, the unfinished hem offers an edgy look for a stylish touch. The perfect pull-on pant that can easily complement our no-fuss style, these leggings will become an instant favorite! The bronze style is that one that really caught our eye! A nice change from the typical black style, this metallic option will certainly turn heads. The ideal option for a night out on the town, this design will definitely make Us the center of attention. We’re also huge fans of the pine (green) hue as an earthy shade that can easily match with our casual and dressy ensembles. A stylish number we can even slip into our work wardrobe, this versatile creation packs a stylish punch! For those who love the classic look, the black offering will fall right in line. We can never go wrong with a dark hue and this option makes styling a breeze. From button-down shirts to peplum tops, we already have a ton of looks in mind. We can also switch it up a bit with the graphite (grey) tone. A flattering neutral that makes the perfect substitute for our trusty staple, this sizzling find is absolutely worth it! A top-quality pair of leather pants can easily set Us back, but these trousers are a budget-friendly steal. Priced at $98, these leggings are a great piece that will last for years to come and are an absolute must-have. Nordstrom shoppers totally agree! Many reviewers love the soft and smooth feel, while others appreciate the great texture and superior craftsmanship. Shoppers also dig that this offering looks and feels like real leather without the big price tag. One reviewer shared that the support in these leggings feels firm and flattering without making it hard to breathe. Ready to hit happy hour with your girlfriends? We can wear this style with a lacy bodysuit, slim-strap sandals, a cross-body bag and a moto leather jacket for a biker babe look. We can also pull out a high/low tunic, mules, a shoulder bag and a suede coat for a polished ensemble. For date night with our beau, we’re pulling out a graphic tee, pumps, a fur coat, a wool Fedora hat and a bold lip. We can also welcome this style into our casual wardrobe with knit sneakers, a boyfriend sweater and a top coat for an athleisure ensemble. For casual Fridays at work, we can pull out a cable-knit sweater, mules, a wrap coat and a tote bag. With sizes extra small to extra large available in select styles, you can bet that we are adding every hue to our shopping cart immediately. Timeless and chic, leggings are a great essential that will easily add a trendy touch to any outfit. Spoil yourself this new year and grab this garment while it’s still up for grabs! We’re sure you’ll love them!